Erica Garner, whose father's 2014 death at the hands of police propelled her into the national spotlight, died at the age of 27 after suffering an asthma-triggered heart attack. Wale Aliyu reports. Erica Garner, the eldest daughter of the New York City man killed in a police chokehold in a case that sparked nationwide protests, died Saturday after suffering an asthma-triggered heart attack earlier this month, the Rev. Al Sharpton said. She was 27. Garner died of natural causes at Woodhull Hospital in Brooklyn, Sharpton confirmed to NBC 4 New York at the hospital. "She was a warrior to the end," Sharpton said. Her official Twitter account also confirmed her passing, saying: "May you find the peace in the next life that you deserved while you were here." Her mother Esaw Snipes-Garner said her daughter suffered her first heart attack not long after giving birth to a baby boy in August. 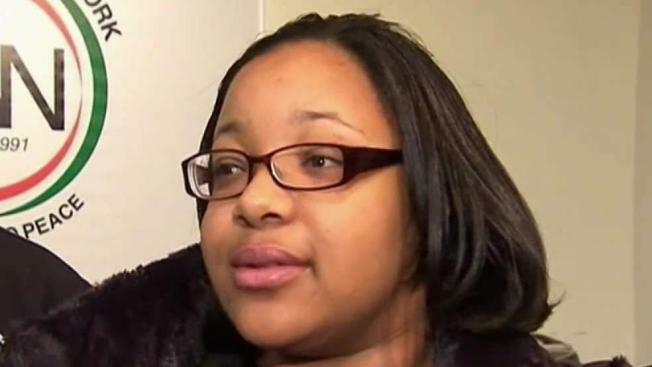 Doctors said Erica Garner's pregnancy had put a strain on her heart, which was later found to be enlarged. Garner became an activist protesting police brutality after her father Eric Garner's death in 2014. He had been selling illegal cigarettes on a Staten Island street corner when he was arrested and a white police officer put the black man in a chokehold. A video of the arrest -- in which Eric Garner cried out repeatedly "I can't breathe!" — was posted online. A grand jury opted not to indict the officer seen on video administering the chokehold, a tactic prohibited under NYPD rules, prompting massive protests in New York City and around the country. The city later agreed to pay a $6 million civil settlement. Asthma also affected her father. While the medical examiner determined Eric Garner's death to be a result of neck compression from the police chokehold, the autopsy report cited asthma, obesity and heart disease as contributing factors. Eric Garner's death was ruled a homicide. "Erica Garner's heart was broken over three years ago when the justice system failed to give her any kind of justice for her father," Sharpton said. "The heart attack she suffered was on the pieces that were already broken." Garner endorsed Bernie Sanders and spoke at events with him. Sanders tweeted Saturday that she "was an exceptional young woman" and "a loving daughter, sister, mother, friend. Mayor de Blasio that her death was "a horrible tragedy." "I am praying for her family, who have already been through so much. This city will miss her unshakable sense of justice and passion for humanity," de Blasio's tweet reads. NFL star and fellow activist Colin Kaepernick, who famously protested against police brutality towards black people, tweeted his condolence saying: "You will be missed by many! Rest in Power." Al Sharpton runs the National Action Network and hosts PoliticsNation on MSNBC, which is owned by NBC Universal, the parent company of this site.